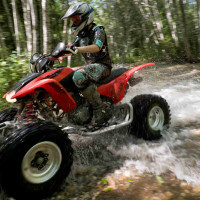 Fast and furious four wheel action, tearing across the countryside on a powerful Quad Bike, tackling a range of terrain, woodland tracks and lots of mud and water, this is an activity that you definitely to include in your event! There are 2 main formats - a cross country / woodland safari or a track based option. Our favourite is a woodland safari which involves crossing fields at high speed, combined with slower technical wet & muddy woodland sections. Quad bikes come into their own in wet winter months and you’ll be glad of the boiler suit and welly boots! Quad bike manufacturers may include Yamaha & Honda, with engine sizes typically ranging from 150cc to 350cc - The bigger the better in our opinion! However this event is less about speed and more about the thrills of riding through the woods, through deep puddles and getting plastered in mud! The best way to build up an appetite for a beer at the end. The length of the activity ranges from 30 mins to 90 mins. Cardiff, Bournemouth & Exeter have some of the best Quad Biking in the UK, so we’d recommend looking there. The quad biking experience is absolutely superb and another one of our amazing driving adventure activities. Whether this is your first time or if you have already experienced the thrills of tearing across the countryside on a powerful Quad Bike, tackling a range of terrain, woodland tracks and lots of mud and water, this is an activity that you definitely to include in your event! We can arrange every aspect of your event, not only booking your quad biking experience, but arranging a whole package of fun including night and evening activities, transport and accommodation. Whatever you want, give us some ideas and let us design your perfect event. Quad biking is a great option for a stag do, exciting activity which has 2 main formats: a cross country / woodland safari; or a track based option. Our favourite is a woodland safari often involves crossing fields at speed, combined with slower technical wet & muddy woodland sections. Quad bikes come into their own in wet winter months and you’ll be glad of the boiler suit and welly boots!